Now that we've gotten our web environment installed on our Linux machine, we can now use a tool called Bitnami to spin up a Drupal site without having to manually set up the database or other configuration. This is a great way to get a Drupal site set up to follow along with the BuildAModule videos, but it does have some limitations. Okay, at this point we have a working web stack and we just need to layer Drupal on top of it. So first we'll do that by using a service called Bitnami. If we go back to the welcome page for XAMPP - I'm just going to click on the Apache Friends link here in the upper left-hand corner - and you scroll down, you see some links here, and I'm going to click on the Drupal one. This takes us to a location where we can download a Bitnami module that will take care of the entire Drupal installation process for us. 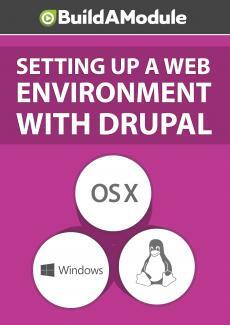 So I'm going to scroll down to the Drupal section, and notice that there's modules for Windows, Linux and OSX. I'm on a Linux 64 BIT system and for each system there's the last three versions of Drupal. So there's Drupal 8, 7 and 6. We're going to download Drupal 8. So I'm going to click on this download button right here and I'll click the no thanks, just take me to the download. I'll click okay to save the file. Once it's downloaded let's navigate to the folder, and again we're going to change permissions on this. So I'm going to go to the command line and I'm going to type change mod, CHMOD 755, and then I'll drag the application over and hit enter. And now as long as we've opened up Nautilus as the super user we can just double click to open this up. Go ahead and select your language, hit okay, hit next. You should be able to leave this folder as is to match up with the current XAMPP stack. Click next and here we're going to setup the administration account for Drupal. So it's really important that you take note of the log-in and your password. So I'm going to fill this in, feel free to fill this in with whatever you'd like. And when you're done click next. I'm just going to give this the name test Drupal 8 site. And I'll click next.